The Truth About Inflation. Paul Donovan. Routledge. 2015. Prices are constantly in flux. Whether it is the creeping increase in the price of cereal or the seesaw housing market, price dynamics are powerful and often misunderstood. Inflation is a topic that is riddled with misperceptions, even amongst the most savvy of investors. In The Truth About Inflation, Paul Donovan examines inflation from a global perspective, cites worldwide urban myths surrounding it and aims to make the topic less muddied for investors of all backgrounds. At the core of the book, Donovan sets out to address what inflation is and is not, so that global investors of all ranks make more astute investment decisions. While investors are the main audience, those interested in economics, finance and economic history will find the book enjoyable to read as well. 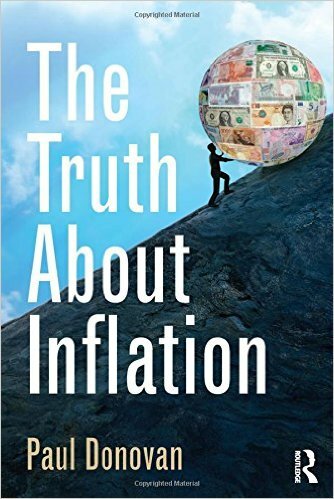 Donovan makes clear from the start of the book that inflation is not a simplistic topic, and that reducing it to a simple statement or formula will paint an inaccurate picture of inflation for the modern-day investor. To qualify as inflation, Donovan makes clear that only a broad-based price change should meet the economic definition of inflation (the rate of change in prices). The reason? A broad-based price change across unrelated products would better reflect a fundamental economic shift in markets beyond short-term fluctuations due to variables like seasonal demand changes. Broad-based price increases are likely to have a genuine impact on the regular consumer, presumably lowering their standard of living if wages do not rise equally. The truth of the matter, according to Donovan, is that the headline consumer price index (CPI) most governments issue on a quarterly or monthly basis is not the most accurate statistic that investment professionals or financial commentators should use when forecasting inflation. In an enlightening section coined ‘The Inflation Hokey Cokey’, Donovan gives a clear overview of the two subcomponents associated with CPI: housing, and food and shelter. Determining the cost of housing is difficult and by no means perfect, because renters and owners face different costs. Donovan educates investors seeking to bet on the housing market to consider inflation from both the perspective of the renter, who may infer inflation to be higher than what it really is, and the landlord, who may infer inflation to be lower than its actual level. Another truth Donovan reveals about inflation is the uncertainty homeowners have in its calculation. The reason being is that if the CPI tells homeowners that their cost of living is increasing only minimally, but the homeowner feels the pinch in their pocket as a result of paying off a mortgage, homeowners begin to distrust the statistic altogether. A homeowner that is eating out less and buying fewer luxury goods feels a decline in their standard of living. If the financial media is telling homeowners that inflation is being held in check, to most homeowners the statistic becomes somewhat of a ‘statistical-economic fraud’, in the words of Donovan. A tempting question to ask of our government is why it does not cancel the nation’s debt by printing more money. Money printing is something investors need to understand, and Donovan does a good job of revealing truths associated with money printing and inflation. 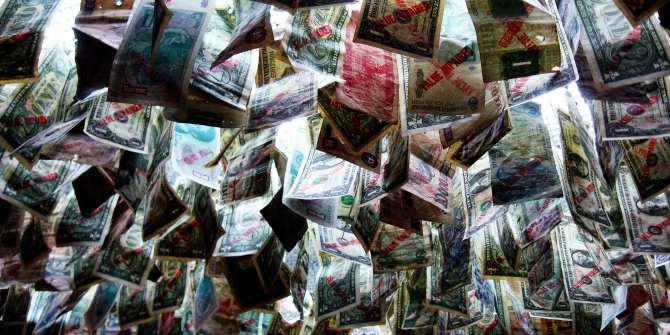 Printing money is not the pure cause of inflation. If the demand for liquidity requires a central bank to print money, that demand should absorb the additional liquidity provided by the central bank without giving rise to inflation. In order to provide cash to the public, the central bank will buy government bonds and treasury bills. The important takeaway point from Donovan is that the central bank may very well not be receiving the right return on these assets, and here is where investors should take caution. If the price of government bonds rises above their market clearing price, bond investors will have to assume higher risk to achieve the returns they are looking for. An interesting perspective that Donovan brings to the topic of inflation is consumer perception of inflation figures. The truth of the matter is that consumer perceptions of inflation are often flawed, and heavily influenced by those purchases consumers make most often. This is shown to be true in both the United States and across the Eurozone. Consumers are more likely to remember prices for everyday items like coffee and detergent as compared with less frequently purchased goods like televisions or furniture. The crucial tidbit is that consumers are likely to judge overall inflation according to those products they buy most frequently, and ignore more stably priced items in their inflation calculation. A further truth is that consumers not only misperceive inflation, but also misperceive in the direction of too high a number. It is therefore important that investors look past the ‘noise’ when assessing inflation. Donovan reminds investors that they would be wise to judge inflation most particularly during periods of low unemployment. The reason is that if consumers generally believe inflation to be higher than what it actually is, in a low unemployment scenario workers may be in a position to ask for higher wages, which could exert upward pressure on inflation. Donovan does a remarkably good job of bringing history to bear on inflation and relaying to the modern investor how they could use these lessons to their advantage. The introduction of the euro across the member states of the Eurozone is a historical episode that should remind investors just how often inflation is misjudged. The introduction of the euro meant that prices were recalibrated from the legacy currency in each member state to the euro note. Retailers preferred round number prices (two euros as opposed to one euro and ninety cents) when listing prices for goods they were selling across the Eurozone. The pattern of misperceiving inflation was rampant across the Eurozone after the euro’s introduction, in part because consumers focused on frequently purchased items, such as the price of coffee (which increased in price from one euro and ninety cents to two euros). Having noticed the change in cost for buying an espresso, Italians misperceived inflation by an order of magnitude that was nine times its actual level in 2002 (18 per cent perceived vs 2 per cent actual inflation). Having set the stage for misperceptions of inflation, Donovan presents an interesting overview of gold and its historical relationship to inflation. There is a general assumption that gold is superior to other forms of currency and that a gold-based currency can help prevent inflation. The truth, as economic data shows, is that a gold standard is likely to create inflation instability in the short and medium term, and to lead to deflation in the long term. The bottom line is that gold should not be thought of as a hedge against inflation. Gold can serve as an important element of diversification in an investor’s portfolio, but should not be treated as guaranteed protection against inflation risk. A more sensible investment approach that Donovan urges for investors is to think of the inflation rate they would want to hedge against in order to generate the income return they desire. Once the investor clearly determines their investment objective and the criterion inflation rate to beat, inflation becomes less complicated and more tractable. Given today’s lower investment return environment, Donovan urges readers, whether they are investors or not, to not push inflation aside as an outdated phenomenon. Given historical precedent, inflation is likely to veer its way back into an economy at some point or another. The modern-day investor should not perceive inflation as a fleeting, chimerical number, but rather understand that different constituencies present the metric to suit their interests and their biases. Throughout the book, Donovan helps readers understand inflation, both for what it actually is and for what it is not. The book gives investors an arsenal of tools for understanding misconceptions surrounding inflation, and hopefully a means by which to understand its true story so that they can make the most sound investment decisions for their future. Alex Verkhivker is a contributor to Capital Ideas at The University of Chicago Booth School of Business. In prior work, he has worked as an economic researcher with the Federal Trade Commission in Washington and as an Associate Economist at the Federal Reserve Bank of Chicago. He has written for the Becker Friedman Institute For Research In Economics at The University of Chicago, The United Kingdom Centre for Policy Studies CapX, Forbes,Huffington Post, Washington Examiner, The Times of Northwest Indiana and Economics 21 – the economics portal of the Manhattan Institute for Policy Research. Alex holds degrees in economics and management from The University of Chicago and UCLA, respectively. You can follow him on twitter @averkh.